A poetic xkcd illustrating scale and parallax. Click the image for the full comic. Indulge your old blogger for a few seconds and participate in a little exercise. It doesn’t even require you getting out of your chair. Locate an object in the room where you are that’s as far away from you as possible (like a light switch or A/C vent). Close your left eye and hold your arm out so that your fist is in a direct line between your eye and the distant object you picked. Without moving your arm or body, open your left eye and close your right eye. Observe what seemed to happen both with your fist and the distant object. If you didn’t move your arm or head, you should have seen both your fist and the distant object appear to move — even though all you did was switch which eye was observing them. The apparent motion was entirely due to the fact that your eyes aren’t in exactly the same place on your head. The farther object appears to move less far than your fist because the distance is larger in comparison to the separation of your eyes. (If the distance is less than the separation between your eyes, your eyes have to cross. I don’t recommend this method.) The technical term for this kind of depth perception is parallax. Parallax, astronomer-style. The pale blue dot is Earth at two different points in its orbit. All distances are shrunk down a lot for clarity -- real stars of course are a lot farther away, so the parallax will be that much smaller. As the xkcd comic above shows, if you want to grasp distance and scale, you need “eyes” that are very widely separated. Even though cameras at either end of a football field can create depth perception for clouds, it isn’t good enough for stars. 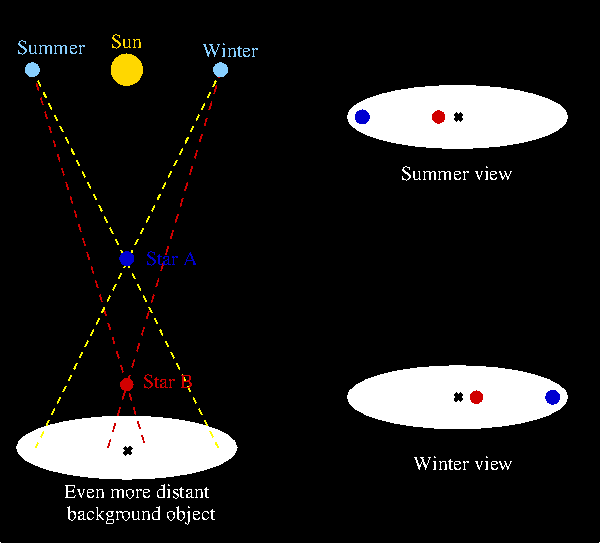 The way astronomers use parallax is to measure the position of stars at several different points during the year: since Earth orbits around the Sun, its position changes a lot, allowing it to act like your left and right eye in the exercise above. The blue (A) and red (B) stars in the image appear to move over the course of a year, and the amount they appear to move depends on how far away they are. By using basic high school geometry, astronomers work backwards from measuring how far the stars appear to move and obtain the distance to the star. It’s one of the simplest and most accurate distance measurements possible! The ancient Greeks and other astronomers of old understood this, but their observations failed to detect any shift in the stars’ apparent positions, so they concluded the Earth-centered universe model was correct. Each degree is then divided into 60 arcminutes. The human eye can distinguish between two objects that are separated by about 2 arcminutes. Each arcminute is divided into 60 arcseconds. If a star appears to move one arcsecond on the sky over the course of a year, it is one parsec (standing for parallax arcsecond) away — about 3.3 light-years, or 19 trillion miles (31 trillion kilometers). The closest star to the Solar System is Proxima Centauri, which is 1.4 parsecs away. In other words, Proxima Centauri appears to move less than 1/60 of 1/60 of one degree over the course of a year, and most stars we see in the night sky are a lot farther away! We can hardly blame the astronomers of the past for not being able to measure parallax: the human eye is simply not good enough to see it. It wasn’t until 1838 that parallax was measured successfully by astronomer-mathematician Friedrich Bessel. On the other hand, the better the telescope, the better astronomers are able to measure distances using parallax, so improvements in technology have allowed astronomers to perform parallax observations for farther and farther stars. Currently, the best instruments give accurate distances to about 1,000 parsecs, which is pretty good — about 2.5 million stars have been cataloged this way. Future telescopes will do even better. However, the galaxy is much bigger than 1,000 parsecs, and the universe of course is much much much much bigger than that. (I’d keep typing “much”, but I think that would lead most of my readers to stop and never return.) For farther distances, other methods must be used, and that’s a subject for another day or another writer. However, those other methods are calibrated by parallax — we won’t see it disappearing as a good technique any time soon.